People wonder questions like: Is microwaving food bad? How can I use microwave safely? Knowing the defects and benefits as well as safety tips can be helpful. Everyone has heard that microwaved food loses some of its nutritional value, but it is hard to separate fact from fiction. Most people wonder if something bad happens to food when we put it in the microwave. Is microwaving bad? The answer can varies from research to research. Some assume that as long as you cook your food correctly, using the microwave is one of the top methods of cooking to retain all of the vitamins and minerals in your food. While others stick to that using microwave to cook scratches some nutrients in foods. Despite of these arguments, there are some dangers when microwaving food. You can accidentally scald yourself. If you don’t use microwave safe containers, you may end up with unhealthy chemicals in your food. Is Microwaving Bad for You? Before the microwave was commonly used in the United States, there was never thorough research on the microwave. 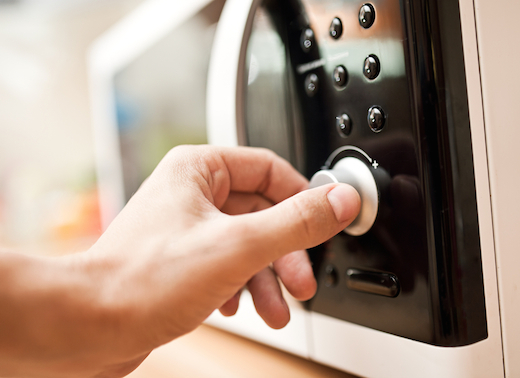 Microwave ovens were first developed over 80 years ago and German soldiers in WWII used them to heat their meals. German researchers conducted a few studies concerning microwaves and their biological effects and although these scientific investigations were supposed to be continued in the United States, it never happened before mass production began. If you start off with a nutritious meal and put it in the microwave, the dielectric heating may create dead food with no nutritional value. That is because molecules move around the interior of your microwave, eventually being absorbed by your food. In fact, water molecules will rapidly rotate in your microwave, doing so in high frequencies that can heat your food by creating molecular friction. This in turn leads to changes in the food’s molecular structure and a decrease in its nutritional content. Vitamin B-12 is a very healthy vitamin, but as soon as you put it in the microwave, the health benefits disappear. One specific study from the Journal of Agricultural and Food Chemistry found that microwaving raw pork, beef, and milk led to a loss of between 30 and 40 percent of the vitamin B-12. This change to B-12’s inactive form occurred during the process of heating food in a microwave. The same was found of breast milk when it is heated in the microwave, specifically the powerful bacteria-fighting agents that make breast milk healthy for babies. Pediatrics examined freshly frozen samples of human milk, checking them for antibodies and lysozyme activity. They then heated these samples for half a minute on high or low power settings. When the breast milk was heated at high temperatures in the microwave, it had 18 times the E Coli growth of un-microwaved breast milk. Even microwaving at the lower temperatures promoted bacteria growth and decreased lysozyme activity. Is microwaving bad? If you heat food in the microwave after wrapping it in plastic, you are adding carcinogens to the food. Both German and Russian studies found that microwave ovens can create health hazards for the environment and people. Many microwavable foods contain toxic chemicals, like xylene, toluene, benzene, PET (polyethylene terephthalate) and BPA. Even the plastic containers that these microwave meals are in release these carcinogens as well as other toxins that your body then absorbs. Swiss researchers discovered that people who consume microwaved vegetables and milk have changes in their blood. The study looked at eight people who ate food which had been prepared in a variety of methods, such as heating it in the microwave. They found that cholesterol levels and white cell levels increased and red blood cell levels decreased when eating microwaved food. Therefore, the non-ionizing radiation from microwaves may affect your heart rate and blood. Microwaves instantly affect your body because of their 2.4 GHz radiation. Researchers discovered that these radiation levels that microwaves emit can affect your heart rate as well as heart rate variability. Although the radiation levels fall within the federal safety guidelines, they typically lead to dramatic and immediate changes in a person’s heart rate. Therefore, if you have chest pain or an irregular heartbeat and frequently eat microwaved food, you should consider stopping. Is microwaving bad? To figure out this confusion, knowing the possible defects of microwaving is incomplete. Still, if you use microwaves in proper manners, there are some benefits. Most of the time, the amount of vitamins in food will decrease as you cook the food, meaning that longer cooking time decreases vitamin content. Because of this, any food cooked for a short period of time will have higher quantities of vitamins (found naturally in the food) compared to food which has been cooked longer, regardless of the cooking method. In fact, Journal of Food Quality published a study in 1994. It was found that when you microwave vegetables, they will have higher vitamin content than if you cook the vegetables conventionally, and this is due to their ability to thoroughly cook food in a short amount of time. Select a food-approved plastic that is clearly labeled “microwave safe”, and never use plastics that haven’t been approved for food. Also, ensure that the plastic contains the international symbol for a food-safe product. Then you don't have to worry about the plastic contaminating your food. Never heat up cooking oilor fats in a plastic container as this can get hotter than the plastic’s melting point, leading to burns. Avoid uneven heating, as this can lead to scalding or microorganism growth. Never rely on domestic microwaves to sterilize your food as the uneven heating and low temperatures make them unreliable for this purpose. Be careful when removing the container. Let the food cool for one or two minutes so the heat evens out. Don’t reheat food for over two minutes as this leads to a scald risk.